Russian television will today broadcast a special report, previewed on Dmitry Kiselyov‘s Вести недели (News of the Week) programme on October 5th. Dmitry Kiselyov is very well known in Russia, and was last year appointed by Vladimir Putin as head of the new official Russian government owned international news agency Rossiya Segodnya. Presented by Arkady Mamontov, a Russian journalist who last year linked the Chelyabinsk Meteorite incident to gay activism, it promises to explore the downing of MH17 in depth, and in the preview they demonstrate the lengths they’ve gone to in their investigation by arranging to have a live fire exercise to test out cannon fire on aircraft. First we’re shown the entry holes created by the cannon fire, several holes of a consistent size and shape. Next, the other side of the aircraft, where along with the larger exit holes we also have much smaller holes of various shapes and sizes. So here we have a pattern of damage established, consistently shaped and sized entry holes and the same shaped exit holes surrounded by smaller exit holes of various shapes and sizes. There’s even a comparison shot of the MH17 wreckage to demonstrate how closely the damage matches. However, there’s been many photographs of the wreckage of MH17 posted online, and some of these show clear examples of the initial damage done to MH17 when it was first hit. This panel, from above and behind the flight deck windows (discussed here at length), shows clear examples of entry holes coming from outside the aircraft. It’s clear that unlike the entry holes in the Russian video, these holes are a wide variety of shapes and sizes. This image shows the full panel with many more points of penetration. It’s also worth noting that many of the 30mm cannon scenarios involve the attacking aircraft coming from below, generally from behind, yet the above images clearly show the impacts coming from above the flight deck. Another example of MH17 entry holes comes from ANNA News, a Russian language news channel embedded with separatists in Ukraine. In this video they are given a tour of the wreckage by separatists, where they are shown part of the aircraft it isclaimed was hit by cannon fire. Here’s a image from the video showing the entry holes. We get a sense of the size of these holes in this image. This is what’s claimed to be entry holes from cannon fire, but as we can see, compared to the Russian TV piece on the damage done to MH17 there’s a significant size difference. It’s been possible to ascertain that the panel in the ANNA News video was positioned above the flight desk windows, on the starboard side of the aircraft (details here), so, as with the earlier example, this shows cannon fire from below and/or behind the aircraft could not have caused this damage. Thanks to the Russian channel’s work we now have a rare chance to compare the damage from cannon fire on aircraft to the damage done to MH17. Based on the Russian channel’s own tests it seems clear that the entry holes visible in the above examples do not match what’s shown in the Russian channel’s own tests. It seems that rather than prove MH17 was shot down by cannon fire as they claim, they’ve inadvertently provided evidence that it wasn’t. “to transparant conspiracy theories that don’t even pass the laughing test.” What about the possibility that the Ukrainians blew this airliner out of the sky from one of the three BUK launchers they had within range of MH17’s flight path, as they accidentally did to a Tupolev airliner in 2001, or that they may have deliberately shot it down as part of a desperate false flag to elicit direct NATO intervention on their side is so insulting to the families Rob? Or better yet, if we can trust the BND — and I don’t until they cough up the evidence and NSA also corroborates since the AWACs, NSA antennae on the ground and USS Vela Gulf all should have detected the same Kupola radar operating near Torez rather than the emitters the Russians detected from known Ukrainian BUK sites they published satellite photos of — how can we now trust Higgins claim that the BUK came from? How can we be certain that the whole thing wasn’t some sort of elaborate set up and the role of the Ukrainian Su-25 you and Higgins insist is laughable even though both the Russian MoD and eyewitnesses speaking to BBC Russian service claim it was there, wasn’t ‘baiting’ the ‘rebel’ BUK into firing on MH17? Perhaps the Ukrainian pilots really were flying as close to civil airliners as possible hoping to create a disaster? I know for naive Westerners like Rob it is hard to imagine the Ukrainians, as opposed to the Russians, could be that evil. Well, my advice to you Rob is to read the Reuters story about how the case against one Berkut riot policeman who is one armed has fallen apart, and the ‘real killers’ of the Maidan have all conveniently gotten away with it. Watch ‘Odessa: What Really Happened” which shows men clearly wearing the red duct tape armbands of Right Sector to identify each other pulling a false flag operation, posing as St. George ribbon wearing ‘pro-Russians’ in order to create a violent clash that will end all peaceful anti-Kiev demonstrations in the city. Watch the video of Ukrainian National Guardsmen shooting two unarmed civilians in Mariupol on May 9. This Ukrainian regime has already been caught at least twice if not three times murdering its own citizens and blaming it on Russia, why wouldn’t they kill 298 foreigners knowing that the US/NATO countries would all cover for them if they screwed up the false flag or left behind incriminating evidence? The Siberian Airlines shoot down in 2001 was because in a joint Russian and Ukrainain war games operation a drone was simultaneously targeted by a Russian owned S-300 and a Russian made Ukrainian owned S-200. The S-300 destroyed the drone target. 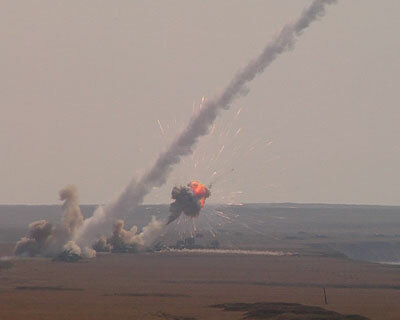 The Russian made S-200 should have self destructed. But instead changed its target to the Siberian flight 160 plus kilometers away. Russia said it was not a possible scenario when Americans said exactly what happened. Soon Ukraine accepted responsibility, while Russia continued denial a while longer. Ukraine stepped up, owned it, and paid compensation. Seprussians shot down MH-17. They should own it. Are you just a naive Russian, or get paid for this nonsense? If you have any evidence for your assertions to MH17, then let us examine this. If not, it’s just chatter of Russian propaganda. The messages of the Russian Defense Ministry at the press conference are already exposed as false. In answer to your first question – they do get paid for all of this posting. I made a similar point on another article. The job they do is to repeat the Russian propaganda myths until they sow so much confusion that the Russian authorities are in their view ‘cleared’ Yet look at some of the admissions made in relation to the conflict despite earlier denials. Yes, they did help Yanukovich flee to Russia. Yes, they did use regular army units to take over the Crimea. Also when their so called ‘truth’ has been proved to be a tissue of lies. See links below. I do not doubt for one little second that the Russian version of the ‘truth’ is the same made up nonsense. For every piece of Russian propaganda you can point out I can point out a hundred from European and US TV and you know it. On firing a Buk missile the earth tremors can be felt upto a radius of 2 km. There is no video or audio or other evidence that BUK missile was fired by militias from the position Kiev claims it was even though it is a populated town. Redbaron07, you are not well informed. There are plenty of witnesses for the launch of the rocket. Besides, the missile was not fired from a city, but in the nearby area. The residents in Snizhne and the residents in Torez have seen and heard. It is very possible that an attack on the cockpit of the 777 could be done if the speed was matched by the su-25, and then was strafed by the military aircraft as it opened fire. There are obvious reasons why such a large aircraft would be attacked at the cockpit. When the air speed of both aircraft has been matched, let say, with the attack aircraft 100m away from tip of the 777 left wing, the attacking pilot then pivots with rudder controls using forward momentum to temporarily (very short amount of time) stabilize the movement of the front of the attacking aircraft for a ‘straight shot’ to the 777 cockpit, then immediately losing that forward momentum, would strafe the shots along the fuselage of the 777 in a line (like shooting a line of bottles from left to right). The holes in the cockpit side of the 777 are too grouped and uniformed to be from the BUK because that missile centers in on heat signatures emitted from the targets engines and would show considerable more damage on the wings as opposed to the cockpit. In the Russian video, they are merely demonstrating the power of the 30mm canons, and the similar structure of the grouping of entry holes. But you would also need to include the exit holes that were created as they show more tearing and damage to the structure. In the test it was a straight shot to a target on the ground, so the test pilot could not of carried out a particular degree of alignment with the test target object whom he was firing the cannons towards. In the sky, you have the benefit of the extra axis to work with (that you can move downward from an assault to any degree of motion due to being able to lower the altitude). With information that the 777 was told to lower air speed and then descend before changing course, it seems very likely that this was a pre-emptive motion by the assaulting party, corresponding with citizen eyewitness reports of visually witnessing at least 1 military aircraft in the exact area that the 777 was bought down to the ground. It makes sense, in many other cases where an opposing military aircraft has been by a BUK missile, there has been a large percentage of aircraft attacked that survive the initial impact and damage, either giving time for pilots to make mayday calls to military ATC or be able to assess the damage themselves and recover from it. If the 777 was hit by a BUK and survived for some reason with minimal damage, it would be more than enough time for the captains to make distress calls to ATC or any other aircraft in the area, or recover, which would uncover such an attack occurring in the first place. It seems now, that with countless hours of research, that MH17 was hit with both a BUK and 30mm canon fire, which would disable the captain and his first officer from recovery or mayday, and the missile bringing down the 777 as a whole. First of all, we must question, the primary stages of the incident, before the secondary stage of what weapon bought it down. Why was the 777 directed over a war zone airspace, told to slow airspeed and descend altitude ? And why have no transcript that the Ukrainian ATC, military or recovered MH17 black box recordings being revealed to the investigations teams, media outlets or the general public, when a similar undefined incident such as the loss of MH370, audio transcripts and aircraft movement data were released to the general public within weeks of the incident occurring? The black box were in top shape, where is the data? As has been pointed out on the PPRUNE website many times, entry holes can look like exit holes when a plane decompresses. Since these planes were shot while they were on the ground, they would not even simulate cannon holes of a plane shot at altitude. The fighter attack has been completely debunked now. An SU-25 can barely keep up with a Boeing 777 at cruise speed – for all those conspiracy nuts how do you suppose it kept up with the 777? It couldn’t and SU-25 aircraft with armaments have not a hope in hell of getting anywhere near firing range of MH 17 @ 33000 feet. There is zero doubt that there was no fighter aircraft in the area and furthermore the video released this week of local residents rushing to the crash scene has them questioning whether there was more than one plane but all state only one plane (MH17 crashing) was witnessed. It wasn’t on radar – Russia’s very own radar operator states no other aircraft in the area other than SIA & AI flights. It’s in the transcripts of the dutch investigative report – all provided from Russia’s own radar records & ATC recordings. Ukraine also provided ATC recordings to the Dutch investigation team. All of the Russian paid trolls on here must now accept that the aircraft was brought down by a rebel fired BUK – the evidence is absolute and incontrovertible. I find it difficult to visualise how a SA-11 70kg high explosive fragmenting warhead even detonating as close as 20m away could create such concentrated damage. There would be a large spray of fragments that one could reasonably expect to result in punctures over a larger part of the fuselage, this is not seen. Solid ‘bullets’ don’t seem to fit, but few have explored timed fuse shells that detonate at a fixed distance after firing. Again, the damage seems to be too localised for anything other than being fired at in close quarters. I would have thought that incendiary type or fragmenting shells would fully penetrate such thin metal before exploding. The 5 or so regular (equidistant) holes in the left side panel clear in the Akkermans photos are tantelisingly bullet like (except possibly the one on the window frame). Without a scale it is hard to determine their size. They don’t look as big as 20mm Anyone know the size of the heads on the screws on the window frame? Infra red air-air missiles would have a large target in commercial jet engines, difficult (but not impossible), to see one missing or overshooting and detonating next to the cockpit. I’m unaware of small radar guided air-air or laser targeted missiles but I expect they exist. I did the maths some time back on the relative velocity of the fragments, as I recall it was all over in a fraction of a millisecond. Tremendous energies. The sooting on the panels could be as much from metal vapour flashes as from explosives residue. Overall just based on Akkermans photos alone I am undecided. None of the circumstantial evidence, while compelling, is sufficient for me either. In short I’m stumped. The type of fragments found in the autopsy especially of the pilot should be conclusive. However, given the geo-politics of the situation, as characterised by the ridiculous secrecy and odd nature of the investigation, I’m inclined not to believe ANYTHING I hear. I really don’t expect the truth to be revealed in this case. So much for expousing the virtues to others of a free and open democratic society.